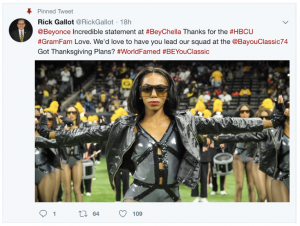 GRAMBLING, LA — April 16, 2018 – On the heels of her record-breaking Coachella performance, President Rick Gallot tweets and invites music artist Beyoncé Knowles to attend the 45th Bayou Classic Game in New Orleans, LA. 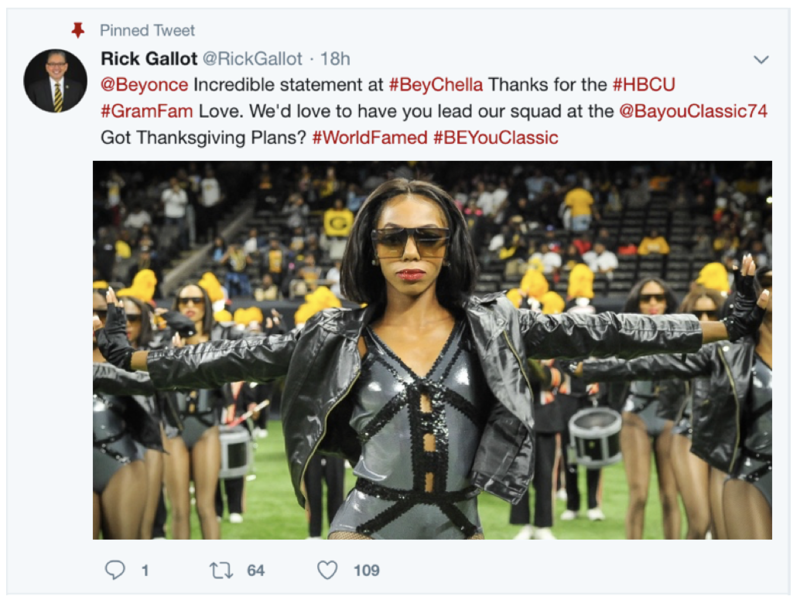 Grambling State, home of the World Famed Grambling State University Tiger Marching Band, has a long relationship with Beyoncé’s music. That history began with her first visit to Grambling State with the group Destiny’s Child in the year 2000. Since then, the Tiger Marching Band has performed Beyoncé’s top hits across the world including Crazy in Love and Flawless. That once-in-a-lifetime event is the 45th Annual Bayou Classic Weekend, where Grambling State University will face off against Southern University for the country’s second-most attended football game, next to the Super Bowl, and the Battle of the Bands. Grambling State University students, supporters, and fans are encouraged to share the hashtag #BeyYouClassic to help show their support. In 2018, Grambling State University and Southern University will celebrate the 45th anniversary of the legendary football game that was the second most-attended football game in recent history. For more information, visit http://www.mybayouclassic.com/. This entry was posted in Uncategorized on April 16, 2018 by Jovan Hackley.